With our year-round temperate San Diego climate, we have picnicked in November, in March, and many months in between. But like chilled watermelon, slushy lemonade, and buttery ears of sweet corn, picnics taste best in the summer months. That's why last weekend Jeff and I went on our first summertime picnic. I could tell you about the weather (grey skies) or the view (choppy ocean waters), but I think you'd be more interested in the food. I was. We brought a bottle of chilled pinot grigio, a salad of heirloom tomatoes, fresh corn kernels, basil, and olives, and eggplant, asparagus, and smoked mozzarella sandwich wraps with red pepper mayo. Dessert was simple: juicy, sweet fresh cherries from the farmers' market. When it comes to vegetarian sandwich wraps there's much more than just hummus, tomatoes, and sprouts. 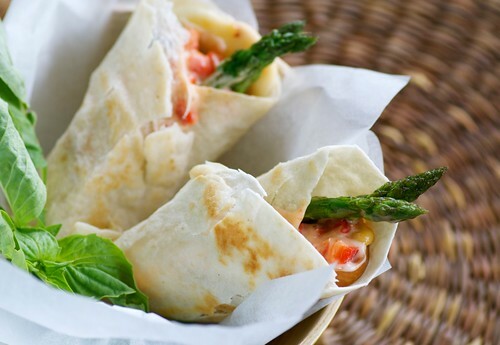 With creamy eggplant, crisp asparagus, and smoky mozzarella cheese, these healthy picnic wraps taste like warm rolled up pizzas but without all the fat and calories. To reduce fat, I brushed the vegetables lightly with olive oil and broiled them and used soy mayo. I also used whole wheat wraps instead of flour for added fiber and protein. I did not, however, skimp on the smoked mozzarella, because to me, it's the star of this wrap. Each bite is permeated with its creamy texture and smoky flavor. Use less if you must, but please don't skip it. So tell me, dear readers, what are you favorite picnic foods, healthy or not? Have you gone on a picnic yet this summer? Tell us about it! 1. Preheat oven broiler. Line a large rimmed baking sheet with aluminum foil. Lay eggplant slices and asparagus on the sheet, not overlapping. Brush asparagus and both sides of the eggplant slices with olive oil and sprinkle with salt and pepper. Broil for 7-8 minutes or until browned. 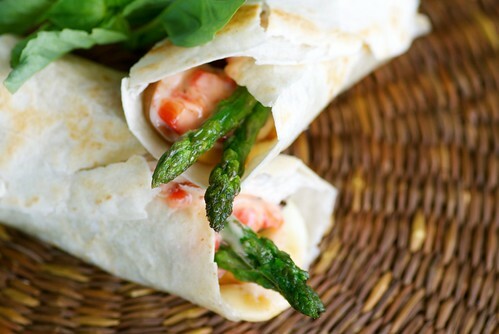 Since asparagus cooks quickly, it may be cooked at this point and can be transferred to a plate. Flip eggplant slices, and broil another 4-5 minutes or until lightly browned. Remove from oven. 2. In a small bowl whisk mayo and red peppers. Set aside. 3. In a medium dry skillet over medium-high heat, warm tortillas for 30-60 seconds on each side. To assemble wraps, place a tortilla on a flat working surface. Spread with 1/4 red pepper mayo. Top with 1 ounce cheese, 2-3 slices eggplant, 4 asparagus stalks, and 2 basil leaves. Roll up, and wrap tightly in aluminum foil before packing. Repeat with remaining ingredients. What a great picnic idea! Those wraps look exquisite! Great photos of the wraps; they look delicious! I'd love to go on a picnic with you guys anytime!! Smoked mozzarella is NOT to be skimped on! These wraps are fantastic...and all the more reason why I need to move to San Diego - to picnic with you guys! Those wraps look like a great healthy alternative to cold fried chicken on a picnic. Haven't been on a picnic yet this year, but I love simple wraps with some nice fresh fruit in the picnic basket. Yum! You're right, those wraps are glorious ... funny I just picked a lot of little baby eggplants in my backyard. I think they'd be just right in these! mmm, you've reminded me of the leftover hickory-smoked goat cheese I have in my fridge. I definitely think it belongs on a wrap with roasted veggies. I'm not sure which I envy more - your climate or these wonderful wraps! I need to do more wraps. It's a sandwich form I don't think of often enough. i love picnics, and this looks delicious! and healthy! Outdoor picnic are impossible here (heat, flies from neighbour's cattle, etc.) but we frequently have indoor picnic lunches on a blanket in the living room. This is a nice recipe to keep in mind-all our favourites rolled into one. BTW-it isn't a picnic around here without liquid bubbles to blow around, but you know those grape scented ones they sell now? Yeah, don't bother unless you want to smell like that fake grape juice that used to come in the little plastic bottles with the foil lids. Ewww. Susan this sounds like a perfect picnic dish to take to Concert Under the Stars!! Those look amazing, Susan! We haven't really picnicked this summer, but we have been packing lunches when we go to the zoo or Wild Animal Park. Vibrant, delicious and healthy - what more could you want? Great mouthwatering photos! What a romantic meal! I don't know why we don't picnic more. These are just fab Susan ... brilliant! The red bell pepper mayo got me! Nom nom nom! This is the perfect summer wrap...or any time wrap for that matter. I would never skip that smoky mozzarella, or those roasted veggies. Simple & perfect! These look amazing! Perfect for a summer picnic. Along with little wraps or sandwiches, I love bringing some delicious cheese, olives and fresh bread or crackers from our local cheese shop. I can't believe it's already end of July and we haven't been on a picnic yet! Sounds like the perfect day, weather aside! I love the gorgeous colors bursting out of those wrap sandwiches! Sounds delicious! I'd prefer an indoor picnic right now where we are, though - it's 100 degrees most days! Susan, I wish I had these for lunch today! Yum! kalyn-Thanks. They're hard to photograph. val-We'd love to have you anytime! joanne-Smart girl. What are you waiting for? tanna-Baby eggplants would be ideal. nury-You don't want an upset tummy on a picnic. kevin-I forget about them too. deborah-Ooh, concert under the stars? Those are so lovely in the summer. stacey-That's always fun too though. nic-Thanks a bunch! I appreciate that. unplanned cooking-They really can be romantic. Plan one for this wkend! deeba-I love red pepper mayo. It's so simple but has so much vibrancy. marla-I wouldn't pass it up anytime either! callin-You've still got all of August and September! tastyeats-I don't blame you. With the AC blasting, right? The eggplant here was good but it was the asparagus I liked the best.